Winship is mourning the loss of an esteemed colleague: H. Jean Khoury. "A great man's life is defined by its impact and not its length." "We are all deeply grieving the loss of this remarkable man who gave so much to Winship. His enthusiasm and love for his patients and his commitment to lessening the burden of cancer for all has been unwavering throughout his life," said Walter J. Curran, Jr., MD, Winship's executive director. "While we all knew Jean as an outstanding clinician who was beloved by his patients, and a true innovator in treatment, what he kept more quiet was his impact on colleagues and trainees as a mentor. The list of people from all over the world who have reached out to me speaking about his role in their career development is so impressive. He was an amazing teacher and colleague and that is what drew people to him," said Sagar Lonial, MD, chair of Emory's Department of Hematology and Medical Oncology and Winship’s chief medical officer. 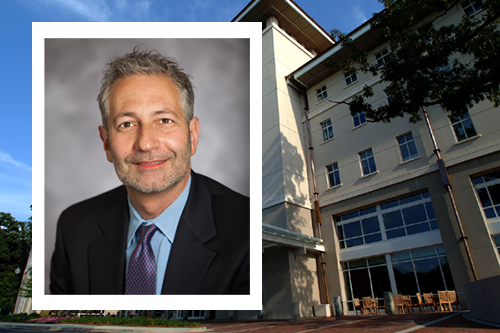 An international leader in hematological malignancies, particularly chronic myeloid leukemia (CML), acute leukemia, and myelodysplastic syndrome (MDS), Dr. Khoury joined Winship Cancer Institute in 2004 as director of the Leukemia Service and associate professor in the Emory School of Medicine. In 2009, he was promoted to professor and director of the Division of Hematology in the Department of Hematology and Medical Oncology, and was later named to the R. Randall Rollins Chair in Oncology. He was recruited to Winship by Fadlo R. Khuri, MD, former deputy director of Winship and now president of the American University of Beirut. What he first saw in Dr. Khoury was someone who was "in the best sense, a disruptive presence." "What you always want in a leader is someone who's not afraid to be wrong, to take risks. Being wrong disrupts the pattern and Jean was very brave. He didn't like business as usual and that showed in the way he took about redeveloping the hematology division, the leukemia program, and his interactions with the transplant division, with faculty and all across Winship," said Khuri. The calm, quiet way in which Dr. Khoury ran Winship's hematology division belied what a forceful presence he was for his colleagues and staff. Colleagues describe him as a ferocious advocate for patients and for high quality research. "He had amazing persistence and he was in it for the long game. If he set his mind to making something happen, it happened," says Lonial. "Jean was a transformative figure for our hematology division, taking the team to a new level in conducting cutting edge research while providing compassionate patient care," said Amelia A. Langston, MD, medical director and section chief of the Winship Bone Marrow and Stem Cell Transplant Program, and executive vice chair of the Department of Hematology and Medical Oncology. "He led and taught by example, and we continued to learn from him even in the face of his illness. His blend of curiosity, determination, caring, and humor will leave a lasting imprint on all of us." Dr. Khoury's guiding principle was how to improve his patients' lives, whether through research discoveries or through compassionate care. Even after being diagnosed with cancer a year ago, Dr. Khoury continued to see patients and carry on his work in the clinic and in his research. Dr. Khoury pioneered the development of personalized treatment for CML patients and better approaches to improve quality of life for survivors. His research focused on drug development in leukemia and MDS, genomic abnormalities in leukemia, development of cost-effective practice models, and outcome analysis of bone marrow transplant. He conducted several leukemia and bone marrow transplant clinical trials, including pivotal trials that led to approval of drugs such as imatinib, dasatinib, and nilotinib. Dr. Khoury received the Georgia Cancer Coalition Distinguished Cancer Scholarship, allowing establishment of the Hematological Disorders Tissue Bank at Emory, which now contains annotated germline and somatic samples from more than 800 patients with various hematological disorders. Dr. Khoury brought a level-headedness to all endeavors. "He was very measured in evaluating everything," said Khuri. "The essence of a generous scientist at heart, everything was subject to the data but human beings were always worth nurturing and encouraging." Winship colleagues also recall Dr. Khoury's devotion to his family, always making sure that he spent time with his children. He died at home with his family by his side. He is survived by his wife, Angela, and three children, Mikhail, Iman, and Alya. In lieu of flowers, the family requests that contributions be made to a new fund at Winship Cancer Institute that will memorialize the life and work of Dr. Khoury by supporting a fellowship program that was so meaningful to him. Please send contributions, marked in Memory of Dr. H. Jean Khoury, to Winship Cancer Institute of Emory University, Office of Gift Records, Emory University, 1762 Clifton Rd. NE, Suite 1400, Atlanta, GA 30322. You may also make a gift to the fund online. A memorial service will be held on Wednesday, May 31st, at 4:30 p.m. at Glenn Memorial Church at 1652 North Decatur Road. Parking is available at the Fishburne Parking Deck. Friday May 26, from 6:00 p.m. to 8:00 p.m.
Saturday, May 27, from 10:00 a.m. to 11:00 a.m.